During the past year I've conducted a bushcraft knife field test comparing 15 different sturdy knives. You can see the test by clicking HERE. One of the contenders was the Øyo Nordic Hunting Knife. The Norwegian family business Øyo was founded back in 1882 and are still going strong by offering cutlery and edge tools. In Sweden you find many of their products at the outdoor and sports store XXL. This is a robust and slim knife offered together with a black leather sheath. The 119 mm long and 3,9 mm thick drop point blade is made of stainless 440 steel. 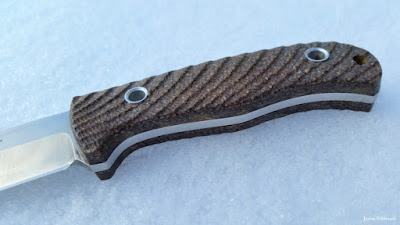 The short handle consists of a full tang, roughly textured composite scales and two tubular rivets. The three holes in the handle could be used when experimenting with different lanyard and other para cord applications for securing and fixating the knife. Although the sheath isn't a premium one; it gets the job done nicely with it's secure fit and drainage hole. Øyo Nordic Hunting Knife is a good looking and nicely performing hunting knife at a reasonable price. 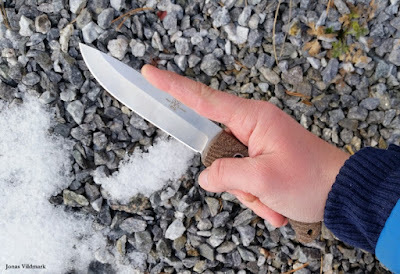 Compared to my test's other 14 knives the Øyo Nordic Hunting Knife ended up at a 10th place. The nice blade gave good points but the short handle still kept the total points low in the test.